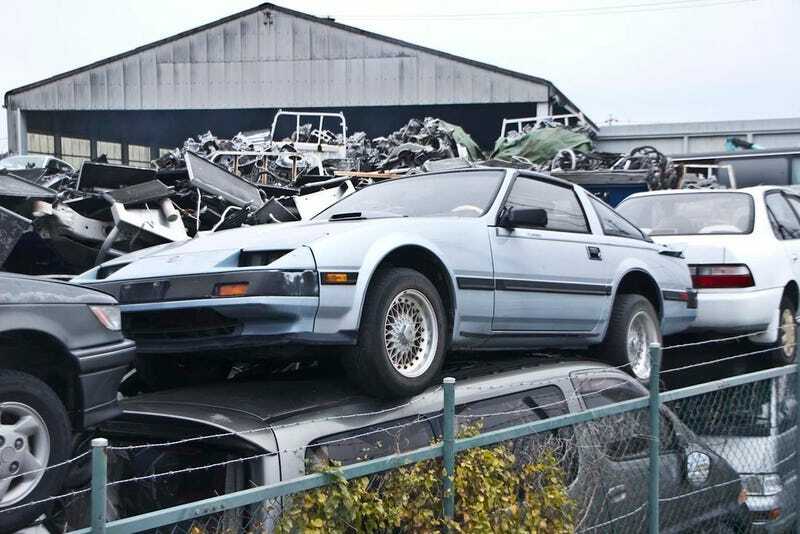 What Happens to Cool Abandoned Cars in Japan? There is one thing you should know about Japan. If it’s old, if it’s defective, that means it goes in the trash. For cars, the trash is called a graveyard. Maybe that it used to be nice? Maybe it still is? No one cares. Garbage! Rubbish! Japan is known to be a country of new things, new technologies, gadgets and so on. It’s also fairly famous for being the country that has the cleanest, newest rust free cars on the road that you can see anywhere in the world. If I’m not mistaking, the average lifespan for a car in Japan is around 6 years, which is insanely low compared to any western country. When a car is deemed too old, it’s sold for nearly nothing (sometimes the seller even has to pay to get rid of his car) and it’s shipped to Africa, India, England or America. Some of those cars don’t get sold because they have a problem. Then, they get crushed or graveyards part them out. Have you ever seen an Autozam AZ-1 on top of an Austin Mini, in a graveyard, rotting away? In Japan, you can. Enjoy (or not) seeing what Japanese do with cars they don’t want! So even if it’s impossible to guess on this picture, this is a massive collection of engine. Truly massive. Only a third gen Isuzu 117, designed by Giugiaro, one of my personal favorite design, along with the Fiat Dino. Like the Mazdda Carol? Well, you can be certain no spare parts can be salvaged off of those! Oh, something that seems to be in good shape! Toyota Corona! And a couple of Benz next to it..
On the other hand, this 2CV Charleston looks salvageable and completely restorable. I’d buy it myself for a good price, but as I said, this guy doesn’t sell anything unfortunately. This one is not going anywhere though. Won’t let it rust either... I just wanted to hug her after witnessing such a massacre. So, who wants to organize a fundraiser for abandoned and beaten cool cars in Japan? Time for me to go to bed, roll into my wife’s arms and cry now. EDIT: if you guys enjoy broken and destroyed japanese cars, I recommend you check out Wasabi Cars, a youtube channel done by an Australian expat living in Nagasaki area. Really cool and tons of old rusty japanese cars to look at.